Join us for a very special Valentine’s Day concert by celebrated Carnegie Hall pianist Katya Grineva who will perform classical romantic favorites to benefit the historic Tarrytown Music Hall. VIP tickets include post-show Champagne & dessert reception with Ms. Grineva ($75). Orchestra Seats ($45). Complimentary tickets available for students grades 6-12. Reserve your tickets now! Ms. Grineva has the special distinction of performing more times at Carnegie Hall than any other solo female pianist and for one night she will be at The Music Hall! 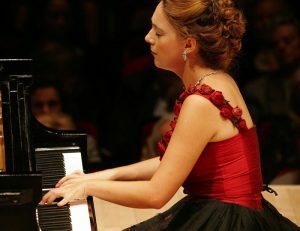 Ms. Grineva has performed throughout the United States, Europe, South America, and Asia and will play The Music Hall’s amazing new Steinway Model D Concert Grand Piano with her unique style and passion. The program of classics will include Debussy “Clair de Lune”, Chopin “Fantasie – Impromptu”, and Beethoven “Moonlight Sonata”. This special Valentine’s event will also celebrate our 39th anniversary of being saved from the wrecking ball. On February 14, 1980, two local residents, Helen and Berhold Ringeisen, were convinced that the historic theater (built in 1885) was important for the community and placed their home & life savings as collateral to purchase the theater and establish it as a nonprofit center for the performing arts. Today, The Music Hall is one of the busiest theaters in the region, offering the best in music, theater, dance and film. Special thank you to Dan Bucci of Coldwell Banker and The Shames Jewish Community Center on the Hudson for supporting this performance, Au Ciel Flowers of Irvington, NY, for their exquisite arrangements, and MadeByRK Catering and Bakery of Dobbs Ferry, NY, for providing delicious desserts for our post-show reception.